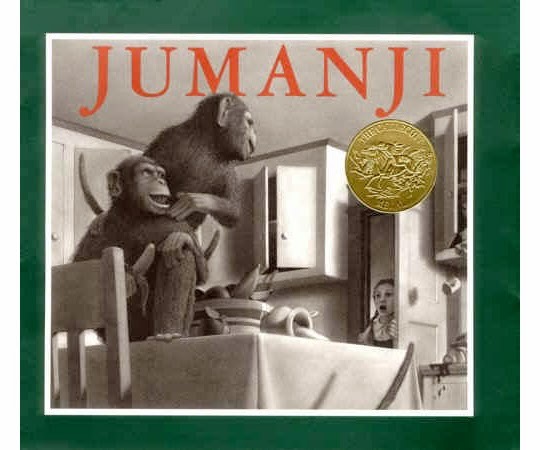 Jumanji is such an excellent book that I hesitated a bit before doing it as a puppet show, knowing I'd have to change it a bunch. But I justify it to myself by saying it's way closer than the movie version, and by using the usual standby: kids will check out a bunch of copies of the book. 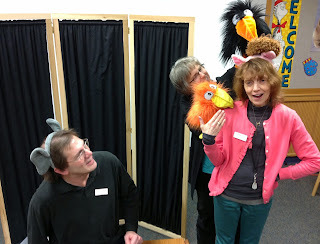 So we did the puppet show for our "K-2 Book Adventure" program on "Award Winners." (a separate post will summarize the program). When I did this show years ago it was a solo show, but we had three people this time (Sheila, Terri, and I) and it was much easier. I played Judy and Peter, the two kids. Terri and Sheila were on either side of me and each had one of each animal puppet. 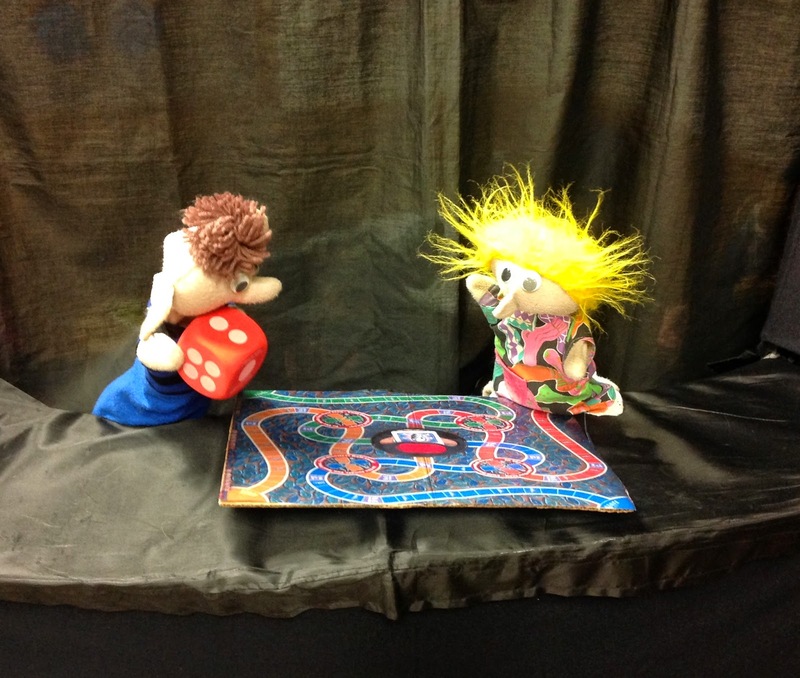 The first change from the book was to jump right into the two kids playing the game. No trip to the park and finding the game. So they're bored at home, discover the game, read the rules, and we're off. 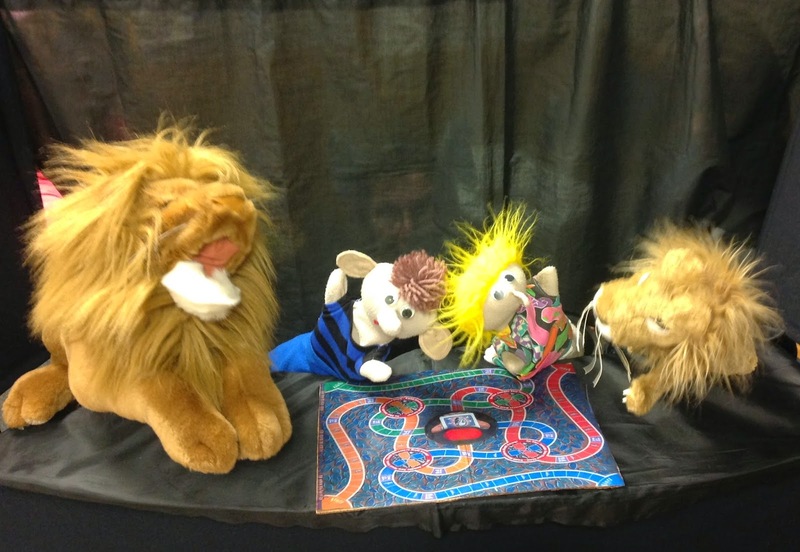 As a puppet show, it's the appearance of the animals and other dangers that are the key. So when one child rolls the die and reads "Lions attack, go back two spaces," Sheila's Lion appears behind Peter on the right, he turns and a chase ensues. They lose that Lion, head back the other way, and Terri's Lion appears on the left, and a chase ensues. And that's the basic pattern. When Judy finally reaches the end, we stretched out the action by having her forget to shout "Jumanji." So the game isn't ended and all the animals (or as many as Terri and Sheila could put out there) converge on the kids until she remembers. And when she says it, all the animal puppets instantly disappear. Since the kids never go to the park in this version, we had to drop the excellent book ending where they return the game to the park and watch two other kids walk off with it (we learn about their game in Zathura). So we added a basic joke to end it up: The kids decide to play a safe, harmless game like "Go Fish," and when one of them says "what could possibly be scary about "Go Fish? 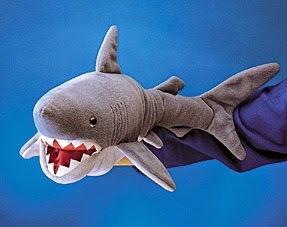 "....two Shark puppets appear and chase them. 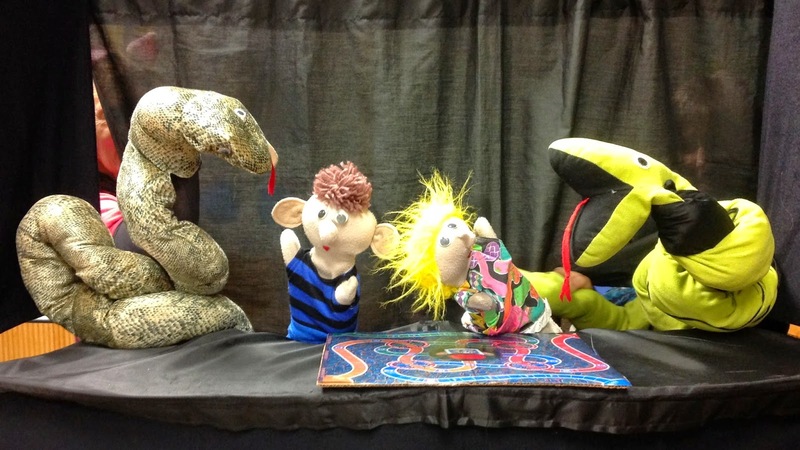 The show was a big hit with the K-2 audience, proving once again that there's nothing like a chase or two to make a puppet show work. It's one that could be done pretty easily with two people...you'd just have to have animal puppets coming from one side only. And you just need a bit of pre-choreographing of the chase scenes to make it work, then there's plenty of room for improvising if you feel like it. The fog machine is not really needed (though we enjoyed using it). As for the Game Board, we just printed an image of the actual board game which came out when the movie did and taped it to cardboard. Actually a very good board game....my own kids played it for hours at a time when they were younger. One of the many benefits of doing two-person storytimes is that you get to do stories that you never would have thought of yourself. 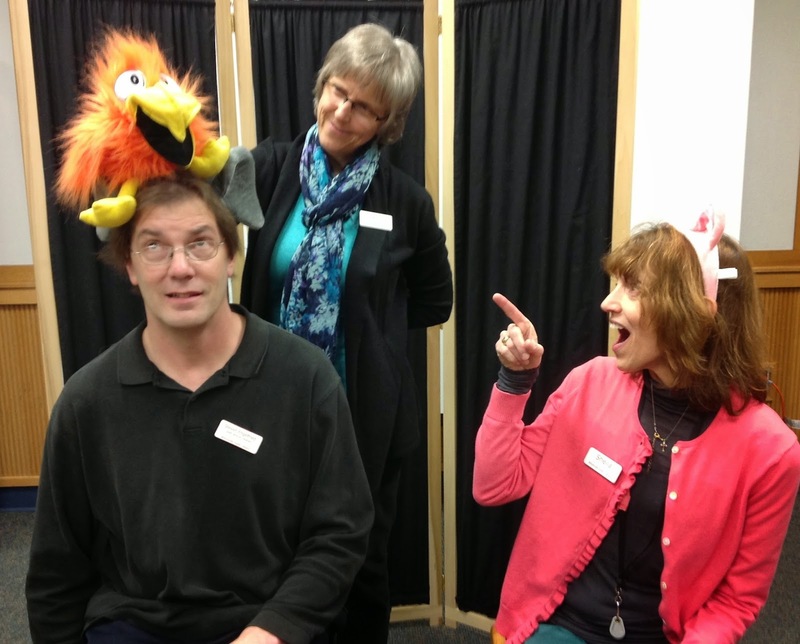 In this case, Sheila and Terri developed the story, Brad came up with a couple of additional enhancements later, and by the time I got a turn at a recent Family Storytime, all I had to do was walk around behind a piece of cardboard. 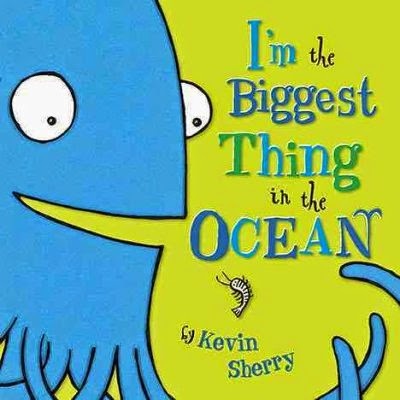 I've used The Biggest Thing in the Ocean as a read aloud and it works great. Sheila and Terri worked out a cool way to act it out with kids. 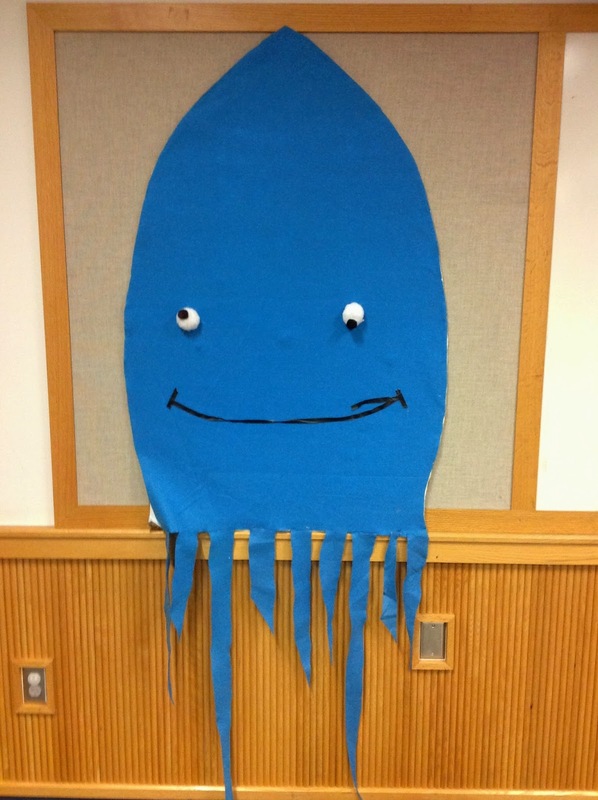 Sheila created a big giant squid, using cardboard and blue stuff which looks like felt, but is actually called something like headliner fabric or cartop. "It was easy," she says, but I don't think it would have been for someone as craft-clueless as me. The squid works kind of like a giant puppet or mask. You just hold it up in front of you and walk around, and you're a squid. You can even have the words written on the back! The story's pretty simple. 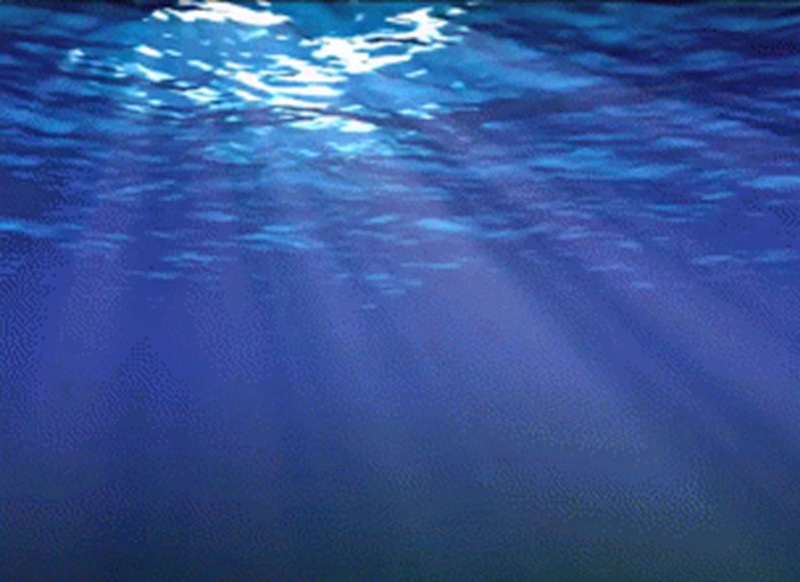 As Squid, I just brag about how I'm "the biggest thing in the ocean." On the screen behind me we projected a silent video of moving ocean water, which was a nice touch....but it would work fine without that too. 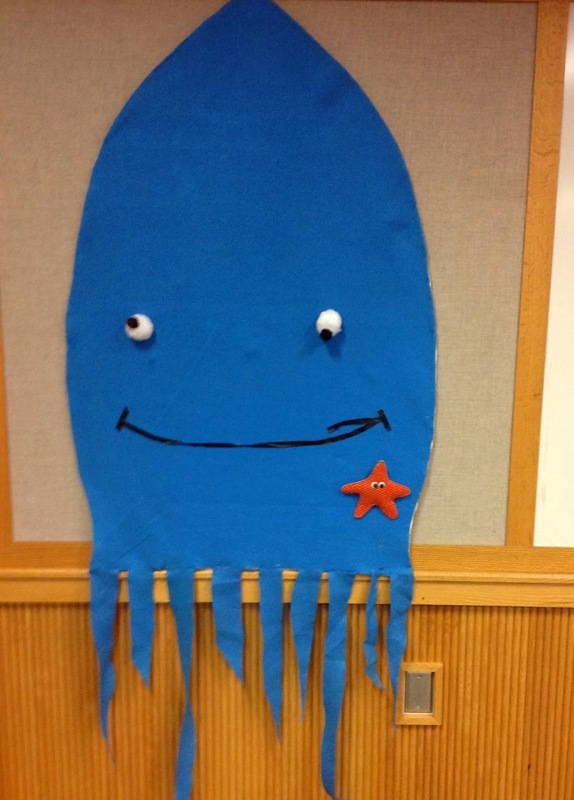 Then Terri enters with a Starfish puppet. 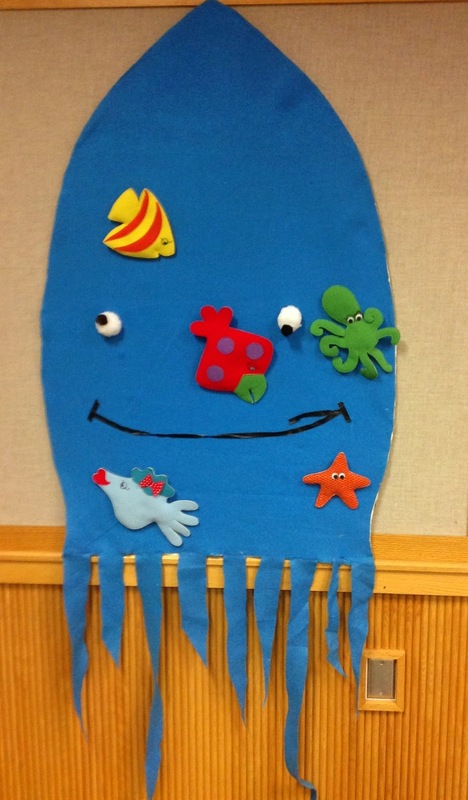 I brag that I'm bigger than a starfish, and Terri attaches the puppet to the squid. The puppets all have velcro and stick easily. And this whole thing could be done with felt figures instead of puppets just as well..
Then he says something like: "I'm even bigger than a Shark, although I'm glad I don't see any sharks around here. They're smaller than me, but they're scary." Terri, meanwhile, has a Shark puppet on her hand and we have a little hide-and-seek-followed-by-chase scene, which adds some action to the tale. For the conclusion, the Squid brags one more time about being the biggest thing in the ocean...then the Whale appears. We used the screen for the Whale, with the image moving slowly across the screen while the Squid retreats just in front of the jaws, then gets swallowed, as I move it out of sight behind a backdrop with the Squid. So imagine the blue Squid in front of a screen, then the whale above slowly moving across the screen from right to left, towards the Squid, and as it reaches the edge of the screen, the Squid moves in front of the open mouth as if being swallowed. 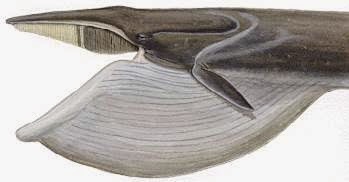 Then the inside of the Whale's stomach appears on screen, and Squid comes out in front of the screen so it looks (kind of) like he's in the stomach, along with all of the other animals that are attached to him. He realizes where he is, admits that he's smaller than the Whale, and delivers the concluding line: "I'm the biggest thing in this whale!" laziness, and their various relatives, but I choose to put the blame on computer Scrabble, which, as it happens, I purchased for $2.99 just a week or two after my last blog entry, and I'm afraid that's too close to be mere coincidence. It's not like I'm addicted, and really I can quit any time I want, it's just that I choose not to. So for now my plan is to get back to blog entries with an unambitious (but attainable) two times a month, and as for Scrabble....well I don't think anyone needs to know how many Scrabble games I play in a month. 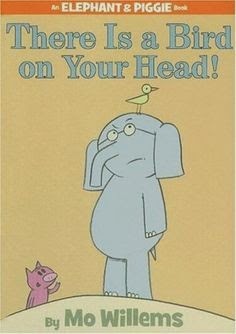 I'll jump back into it with yet another Elephant & Piggie. We did There Is a Bird on Your Head for a K-2 Book Adventure program on "Award Winners" (it won the 2008 Geisel Medal) and the repeated it for Family Storytime. 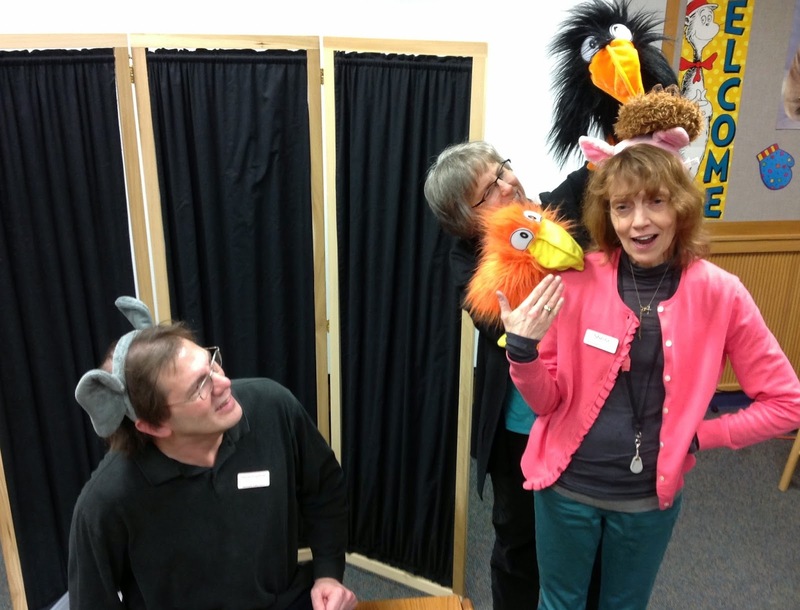 We acted it out with me as Gerald and Sheila as Piggie (as usual, but one of these days we're going to switch roles, challenging stereotypes of gender and height, just for fun) and Terri with the Bird puppets. 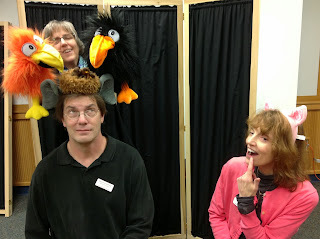 Sheila and I sat, while Terri moved the first Bird onto my head. She didn't talk for the birds, but gave little chirping whistles that were just right. As usual with a Mo Willems, we stuck to the word from the book very closely. When Gerald first learns there's a bird on his head, I jump off the chair and run away, while Terri takes the first Bird behind our backdrop. Then I return and she comes back with two birds. Then there's a progression as the birds go to work, while Gerald gets increasingly worried about what's going on up there. They bring out a Nest. Then an Egg. Then Chicks. In the book it's three eggs, and although we do have three plastic eggs, its too hard for a puppeteer to manage them along with two birds and a nest. So Terri showed one egg, and Sheila stood up, looked into the Nest, and counted three. 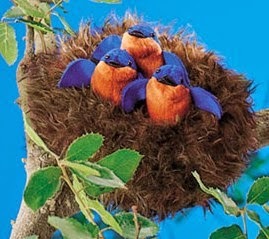 We do have three baby birds. Actually they're three finger puppets connected to that nest (it's a Folkmanis nest that they don't make any more but you can find it on ebay and elsewhere). So Terri kind of pulled them up so the audience could see them peeking out. As with most Elephant and Piggie's, you have to take your time with the dialogue and don't really need to overdo it. The characters and pace is so strong that the kids totally get what's going on and why it's funny. Piggie finally suggests that Gerald simply ask the birds to leave, then Sheila exits. The birds do leave, as Terri follows her behind the backdrop.